Home » update » Olivia Oakeley and her dressage horse Donna Summer, taking a well earned break, following coming 5th in the European Young Riders Championships in Arezzo Italy. Ted gave her horse a copy of his book. Olivia Oakeley and her dressage horse Donna Summer, taking a well earned break, following coming 5th in the European Young Riders Championships in Arezzo Italy. Ted gave her horse a copy of his book. 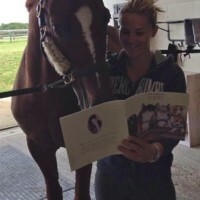 Posted by ch on Aug 31, 2014 in update | Comments Off on Olivia Oakeley and her dressage horse Donna Summer, taking a well earned break, following coming 5th in the European Young Riders Championships in Arezzo Italy. 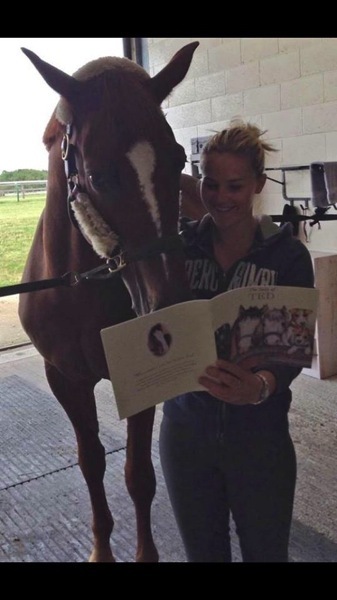 Ted gave her horse a copy of his book.